"It may be crazy, but we'll do it. The 'Duelling Cavalier' is now a musical!" Somehow it seems ridiculous to write criticism about what is generally considered the greatest movie musical of all time, ranking among the very greatest movies, period, of all time. I happen to agree wholeheartedly with these rankings, so you won't find any controversy here. Suffice it to be said that this is a visual feast with an engaging story and characters, wrapped up in terrific dancing, centered on the title song setpiece that screams "Hollywood!" like nothing else. In 1927 Hollywood, Don Lockwood (Gene Kelly) and Lina Lamont (Jean Hagen) are the most popular couple on the screen. But with The Jazz Singer and the advent of sound, they will need to make the transition to a new medium. Don is fine, but Lina has a voice that is not only annoying, but a delivery that spells disaster for their costume drama The Duelling Cavalier. With the help of Don's sidekick Cosmo Brown (Donald O'Connor) and Don's new sweetheart Kathy Selden (Debbie Reynolds, in her first starring role at age 18), they hit on the idea of converting the film to a musical...and having Kathy dub in Lina's dialogue and singing. But Lina's ego stands in the way, and disaster looms. It's somewhat surprising that the picture turned out as well as it did, being stitched together in a most improbable manner. Arthur Freed, longtime head of a unit of movie musicals at MGM, had for many years written songs in tandem with Nacio Herb Brown. 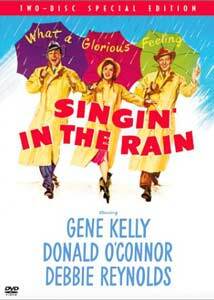 Freed decreed that screenwriters Betty Comden and Adolph Green come up with a screenplay built around the songs that Freed & Brown had written, including Singin' in the Rain. The result works surprisingly well, despite these rather misbegotten origins. No small part of this is attributable to the charisma of Reynolds, O'Connor and particularly Kelly. Despite being adored by millions, he nonetheless sits still for his comeuppance several times (usually thanks to Reynolds). But the real centerpiece here is the dancing. When you combine the graceful physicality of Kelly with the wild unpredictability and flexibility of O'Connor, the result is a real treat. Even those who don't have any particular interest in dance will still find this picture highly appealing due to their vigorous and seemingly effortless footwork. O'Connor's antics are well-served in the Cole Porter ripoff Make Them Laugh, and he together with Kelly does several terrific turns throughout the film. Near the end there's an extended Broadway ballet (based on Broadway Melody and Broadway Rhythm), featuring Cyd Charisse as an unattainable gun moll. Although the sequence goes on a bit too long, it does feature a mind-blowing segment set on an enormous Daliesque set, while Charisse cavorts wrapped in a seemingly endless veil that flutters impossibly. The enthusiasm is certainly infectious. The comedy is occasionally a little forced, but there's much genuine humor and warmth here. The lofty reputation of Singin' in the Rain is thoroughly well-deserved. Image Transfer Review: This transfer was done after a major digital reworking of the existing source materials (the negative went up in the same MGM vault fire that claimed the last print of London After Midnight). The three-strip Technicolor was precisely aligned and the the results are simply jaw-dropping. This is utterly gorgeous from the word go, with a clarity and sharpness that makes it look as if it were shot in high definition yesterday. Colors are rich and fine detail and texture are abundant; the weave of Kelly's coat is apparent, as is the buildup of the pancake makeup that O'Connor wears. One could hardly hope for a movie of this vintage to look this good, but it does. A few minor items that keep this from an A+ grade: during the Broadway Ballet sequence, the red background behind Cyd Charisse is oversaturated a bit and has a little video noise. Also, on rapid zooms and pans, momentary aliasing is evident. But this is hardly anything to complain about seriously; the film as a whole has been given an incredible treatment. Comparing it to the old transfer (seen in the documentaries) is a true revelation. Audio Transfer Review: A new 5.1 audio track is provided, and it sounds very good indeed. There's no hiss or noise, just sweet clarity. The surround effects are subtle and don't have a tricked-up feeling as is often the case in a modification of a mono track. But for the purists, the original mono track (also quite clean) is provided in both English and French. Extras Review: As befits a film of this stature, the special edition package lets out all of the stops. First up is a commentary that includes just about all the surviving participants, and considering this picture was made over 50 years ago, it's a frankly astonishing number of people. In fact, the track at times seems rather crowded. Might there have been sufficient material for a second commentary track? But then again, perhaps not, since many of the same anecdotes are told again in the supplemental documentaries, and hearing them a third time really isn't necessary. Debbie Reynolds acts as mistress of ceremonies, and things are kept moving at a nice clip. There's plenty of good information here, and one can hardly resist so many show business legends in one place. One of the niftiest facts related is that the famous and irresistible vamp on the title song is not by Freed & Brown, but was provided by MGM orchestrator Roger Edens; it's nice to see Edens finally gain acknowledgment for this vitally important contribution that gives the song much of its memorable character. Disc One also contains a couple of backup features. The first is a brief history of the development of sound films, with clips from the 1926 Don Juan, The Jazz Singer (1927), The Lights of New York (1928, the first all-talkie) and The Broadway Melody (1929, the first movie musical). In addition, the film can be played with the 'Inspirations' feature activated; this causes a green reel of film to appear onscreen periodically, which will take the viewer to some additional clips. Unfortunately, there are only three of them, so it might have been more useful to put these in a separately accessible place. Among these is an outtake featuring John Gilbert, the textbook case of the silent star unable to make the transition to sound. This inclusion was particularly welcome, since one often reads of Gilbert's woes, but seldom is the opportunity provided to hear him for yourself. In addition to a trailer in very nice shape (though not quite as good as the main feature), there is a list of the cast and another of awards. Then on to Disc Two. The proceedings begin with a lengthy (01h:26m:03s) documentary on the Arthur Freed unit at MGM and the musicals that he produced and for which he wrote songs. This documentary is well done and provides plenty of useful background to anyone new to the form of the musical, and contains a ton of clips (almost always featuring entire songs) from the heyday of the MGM musical. More attuned specifically to this film is What a Glorious Feeling, a new documentary on the making of Singin' in the Rain. Alas, this tends to be heavily duplicative of the commentary, but it's nice to see these participants as they are now. A nifty sequence allows the viewer to see the films from which the Freed & Brown songs were culled, and the often very different presentations that they were originally given. These feature such luminaries as Bing Crosby, Judy Garland, Ukelele Ike (Cliff Edwards, best known today as the voice of Jiminy Cricket), Jeanette Macdonald, Buddy Ebsen and Eleanor Powell. Between this feature and the Freed documentary one thing is apparent: Warner is sitting on an enormous wealth of great musicals that they ought to be releasing to DVD. There's even a deleted scene that has somehow survived across the decades: a number, You Are My Lucky Star, sung by Reynolds was cut from the film before release (though the reprise of it sung by Kelly in the finale remains in the picture). It's in quite admirable shape and gives a little more backstory to Reynolds' character and her secret adulation of Don Lockwood. Reference is made to another deleted sequence, a Kelly dance number, but this apparently (and sadly) has not survived. But if that isn't enough of the music for you, you're in luck: over an hour and a quarter of scoring sessions is included, with a variety of alternate takes of songs. Some of these don't add much, but others are quite interesting, such as a 'calendar girl' bridge to the song Beautiful Girl and a very distinctive unused version of the main title song. Oddly enough, the pause feature is disabled during this segment, so once you embark you'd better be ready for the long haul. Whew. Wrapping things up, there is a slideshow of a still gallery that features about 30 shots. Unfortunately, someone was asleep at the switch here. The photos are cramped and distorted as if they were meant to be played back on an anamorphic display, and even then they barely take up half of the screen. Oh well, that's a pretty minor gripe after this wealth of material. There's enough to keep any fan of the film occupied for a very long time. One of the great motion pictures, with a dazzling new transfer and tons of extra features. So why isn't it in your collection?